The Rocky River Rotary Club has not only made it possible for dozens of Lakewood High School students to study abroad, but also for foreign exchange students from all over the world to learn what it’s like to be an American high schooler for a year. Football games and fast food, homecoming and hotdogs, and politics and prom are all part of the experience. However, some of the most memorable experiences come from the time spent with their host families. Without our host families, the Rotary Foreign exchange program could not exist. For decades, Lakewood has been the most welcoming club in our North East Ohio District 6630. Our district, which includes 53 clubs, hosts 10-12 foreign exchange student annually. Lakewood High School has consistently welcomed 2-3 of those students every year. The exchange students love Lakewood for all the reasons we do: friendly residents, walkability, diversity, educational opportunities, access to the arts, sports & recreation, just to name a few. In many countries around the world, being a Rotary Foreign Exchange student is often limited to children of Rotarians or community leaders, and the programs nearly always require that parents of outbound exchange students host an incoming exchange student. Here in Lakewood, our outbound students come from widely varied families, and the number of outbound students varies from year to year. Together, this makes our program more challenging. Over the years, Rotary has relied on the kindness of so many Lakewood families that have generously hosted foreign exchange students, whether they have an exchange student going outbound or not. Rotary provides the financial support for the Rotary Youth Exchange program, as well as counselors and guidance for the students. However, the students need a place to stay in the community. Host families are asked to host an exchange for 3-4 months, as Rotary would like students to live in 3 homes during their year here. This allows the students to get to know different families without placing too large a commitment on any one family. Host families are not paid, but the exchange student receives financial support from Rotary that pays for educational expenses, sports, clubs, extracurricular activities and a monthly allowance for spending money. Hosts families are responsible for a safe and welcoming home, a place to sleep, meals, and making sure their student can get to school and activities. 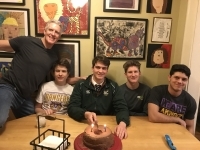 Families host while their high schooler is abroad on an exchange, or after they return, to pay back the hospitality their son or daughter enjoyed. Some families pay it forward, because their child might be considering being an exchange student in the furure. Young families often host to allow their children to have a personal experience with someone from another culture. Younger adults might host because they enjoyed living or traveling abroad in the past or hope to in the future! Empty nesters, or parents with a student in college host to add a little excitement to their routine. Host families are younger, older, large, small, married, divorced, widowed, retired….in other words…like us. What they do have in common is generosity, curiosity, patience and understanding. Your exchange student might be just an interesting guest or they might become a lifelong long distance member of your family. You may find that you have a lot in common, or not so much. Still, you can’t help but respect any young person who is brave enough to give up what’s familiar to try a new life, a new language, and a new culture, and we have nothing but respect and gratitude for the host families who make it possible. We would love to introduce you to our current exchange students, Pati from Thailand, and Eduardo From Brazil. Additionally, we can connect you with other families that have hosted exchange students…one of them might be your neighbor! Kirsten Senger is the LHS Interact and Rotary Youth Exchange Assistant Coordinator. She and her husband are the parents of a former outbound exchange student, and their family has hosted 5 inbound foreign exchange students over the past 8 years.